Hector De La Cruz is looking to guide the Osprey to their first league title since 2006. The Missoula Osprey and the Pioneer Baseball League announced on Sunday that Osprey manager Hector De La Cruz has been named Pioneer League Manager of the Year, and three Osprey players have been honored as Pioneer League All-Stars. 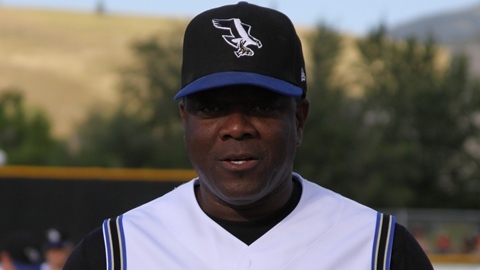 De La Cruz has led the Osprey to the best record among North Division teams, and their first PBL North Division First-Half championship since 1999. De La Cruz, who is in his fourth season as manager in Missoula, is the second Osprey manager to earn the award, the last being Chip Hale in 2001. "We are so happy for Hector and this well-deserved honor," said Osprey Executive Vice President Matt Ellis. "He is one of the best managers I have ever had in my 22 years in the game." Part of the credit for the success of the Osprey squad is an uncanny mix of experience - most of the current roster was either drafted out of college, has had experience in the Arizona Diamondbacks' system, or a combination of both - and team chemistry, which players have often been quoted as saying is a key to their success this summer. That is an item that De La Cruz has built within the Osprey clubhouse. "No one is able to balance a clubhouse like he does," added Ellis. "His teams have fun playing the game, but at the same time, he gets their respect and they play the game hard and in the right way. His players are better off and on the field when he is done with them. I think that is the best compliment you can give a Manager." The Osprey have posted a 39-26 record through Saturday's games, and ran away with the North Division First-Half title behind timely hitting, strong pitching and a solid defense, as well as going on a seven-week stretch of not losing consecutive games. The 2011 Osprey have already set one team season record in home runs (81), and are poised to set at least two more club standards - team defense and strikeouts. One of the reasons this squad has set a new home run standard is All-Star first-baseman Jon Griffin. The 6-foot-7 Griffin leads the Pioneer League in home runs (16), and is third in RBIs (53) while toting a .303 batting average. The 21st-round pick by the Arizona Diamondbacks in the 2011 MLB Draft is currently two home runs shy of tying the single-season mark, set in 2009 by current Arizona Diamondbacks first baseman Paul Goldschmidt. A pair of Osprey starting pitchers has also been named to the Pioneer League All-Star team, in left-hander Taylor Siemens and right-hander Raymond Hernandez. Hernandez, a 48th round pick by the D-backs in the 2011 MLB Draft, earned the second-most votes and was a finalist for the Logan Hurlbert Award, given to the Pitcher of the Year. Hernandez enters Sunday's action with an 8-1 record and a 3.13 ERA, leading the league in wins and currently stands second to Siemens in ERA. Siemens, the D-backs' 18th-round pick in this past June's draft, leads the Pioneer League in ERA (2.26) and has posted a 3-1 record, while striking out 59 batters in 55 2/3 innings pitched. Siemens was also a finalist for Pitcher of the Year honors. Eight other Osprey earned Honorable Mention honors, including infielder Eric Groff, who, along with Griffin, was among the finalists for the Ralph Nelles Award, which is given to the league's Most Valuable Player. Other players named to the Honorable Mention list include catcher Roidany Aguila, utility players Tom Belza, Stephen Cardullo and Fidel Pena, shortstop Josh Parr, outfielder Chris Ellison and relief pitcher DJ Johnson. The Osprey will return home for a three-game series with the Great Falls Voyagers beginning on Tuesday, August 30. Tickets for all Osprey home games are now on sale at the MSO Hub Box Office, located at 140 N. Higgins, by phone at (406) 543-3300 or online at www.MissoulaOsprey.com. Honorable Mention (Missoula players only): C Roidany Aguila, IF/OF Tom Belza, IF Eric Groff, IF Stephen Cardullo, OF Chris Ellison, RHP DJ Johnson, IF Josh Parr, C/IF Fidel Pena.